If you ask me, there is NOTHING better than a long weekend for family fun. Two solid days to party like a rockstar (albeit a PG-rockstar) and a whole day to recover! And the weather reports are good to go folks – so get out there and have an excellent Fourth of July! The Omnimax Theater at the Museum Center starts two new shows this weekend (they run through the Summer, but why wait?). Be one of the first to check out Mysteries of the Great Lakes or Legends of Flight. Details and showtimes can be found here. 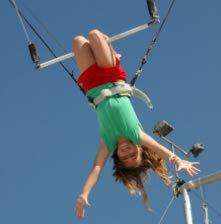 Trapeze anyone? 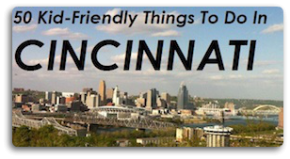 Yeah, that’s right Cincinnati is the proud home of the ONLY public trapeze in the Midwest. Run away to the circus – even if only for the afternoon. You can find The Amazing Portable Circus and it’s trapeze at Newport on the Levee every Thurs – Sun. Check their site for exact times and costs before heading down there. Add in a trip with Ride the Ducks for a full day of memories! ManaTea – perfect for kiddos 2-6 – enjoy tea time and some tasty treats at FFC’s favorite children’s bookstore: the blue manatee. Cost is $4 per child, call them at 513.731.2665 to reserve your spot. Get your grill on with Hamilton County Park’s Friday Night Grillouts from 5:00 p.m. to 8:00 p.m. at Lake Isabella, 10174 Loveland-Madeira Road, Symmes Township/Loveland area. Check their site for all the details and the yummy menu. Plus, live music from Katie Pritchard so you can get your groove on too! You and me goin’ fishin’ in the dark…Fishing is open til 1am at VOA Park. Check their site for all the wormy details. Motor vehicle and MetroPark’s fishign permits are required. You know how much we love the Hamilton County Park District here at FFC! And this Saturday is just another reason why! Check out their site for more details. Bustin’ Science Myths – a real life MYTH BUSTERS at Miami Whitewater Forest Visitor Center at 1pm. Can an egg really balance on its end once a year? Go find this out and more with fun, hands-on science experiments! Do your inquiring minds want to know? Put that natural curiosity to good use at the Museum Center’s Cincinnati Union Terminal House Detective Agency. Saturday 10-12 and 1 to 4. Kids ages 6-12 can solve mysteries in and around the History Museum, there are ranks to be earned and prizes to be purchased using their Agency “paycheck”. Cost is $5 per child to join the fun. 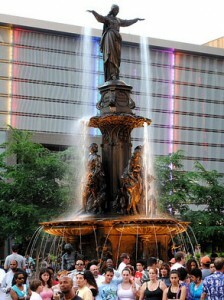 Movie Night on Fountain Square – Saturday’s pics include Fly Me to the Moon, followed by Apollo 13. Shows start at 7 p.m.
Before the movie madness begins though, Equinox Cincinnati/Pride will be hopping on the Square with the Equinox FUN ZONE: Bouncy House & Slide for the Kids, Giant Inflatable Slip N Slide, Giant Inflatable Twister Game, Inflatable Obstacle Course, HRC Dunking Booth, Equality Cincinnati Hot Dog and Snow Cone Booth and more – bring your swimsuit and join in from 11am-3pm! 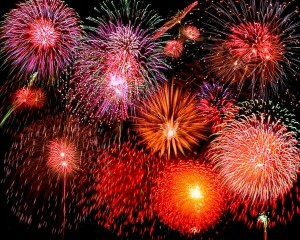 Be sure to check our Fourth of July listing for a ton of information on area festivals and of course FIREWORKS! Holiday Kids’ Fishing Tournament at Lake Isabella Boathouse 10am-12pm. For kids 12 and under and prizes will be awarded. More information can be found here. Creekin’ at Sharon Woods 3pm; Take a stroll around the creek and find where fossils, frogs, salamanders and more call home. Cheese and crackers ladies! With all this awesome stuff going on, how do you decide what to do?